I was watching reports on the Kashmir floods on television today. Reporters in Srinagar went around a few neighborhoods that had been partially submerged in the waters of the Jhelum river and talked to people living there. The impression I got was that there was no longer any serious danger to life and limb in Srinagar, and that the problem there was now merely one of logistics. Many families (I believe 700,000 people) had decided to remain in their partially submerged homes, on higher floors that the waters wouldn’t reach, and now had no way to procure food and water for themselves because the roads were impassable and because the phone lines were down. It seemed to me that these people could procure food and water if they could put together makeshift boats to get around in. So, I started thinking of ways to build boats with household materials. After thinking about the problem a little, I hit upon a simple boat design that anybody with a bed and some waterproofing material can construct. 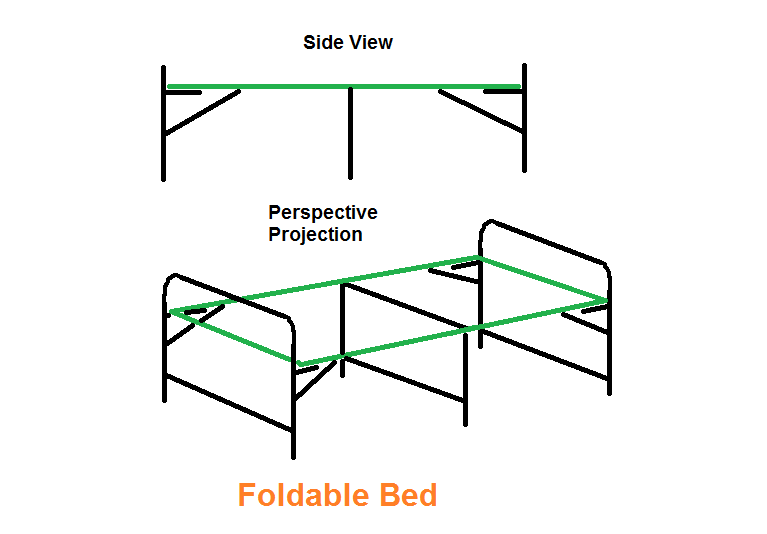 Step 2: Turn the bed upside down as shown in the image below and if it is a folding bed, connect the legs with supporting rods. 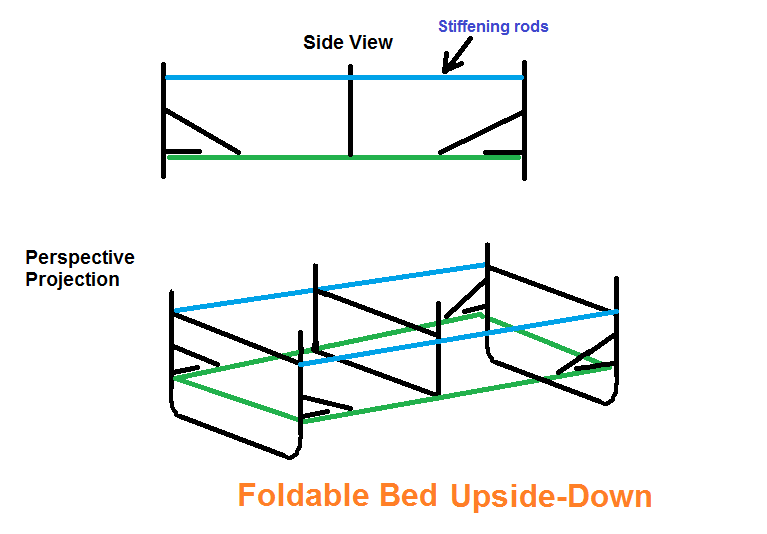 If the bed is a stiff wooden bed, it might be possible to merely link the legs of the bed together with rope. 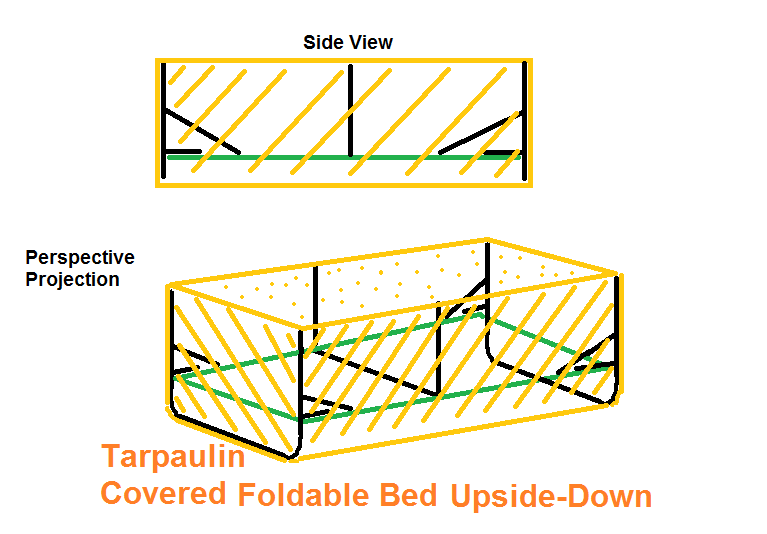 Step 3: Cover the bed with a waterproof tarpaulin sheet (such as the sheets you’d cover your car with). 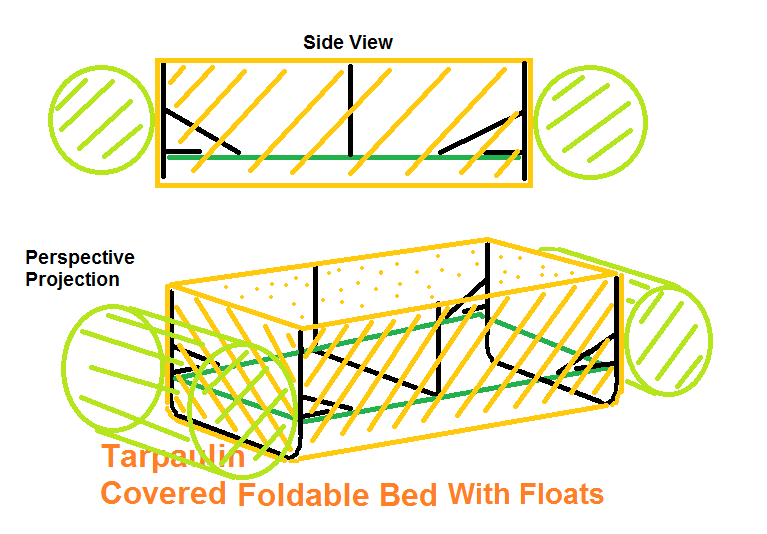 Step 4: Optionally attach floats to the ends of the bed (to prevent sinking of the tarp tears). Each boat should easily carry one or two people. The boats can be roped together to make larger craft that can act as taxis. We shall have to try this design out and make sure it works in practice because the forces on the tarpaulin could tear the fabric. So the raft would work only if the tarps were strong enough to withstand the forces on the sides and bottom of the craft. 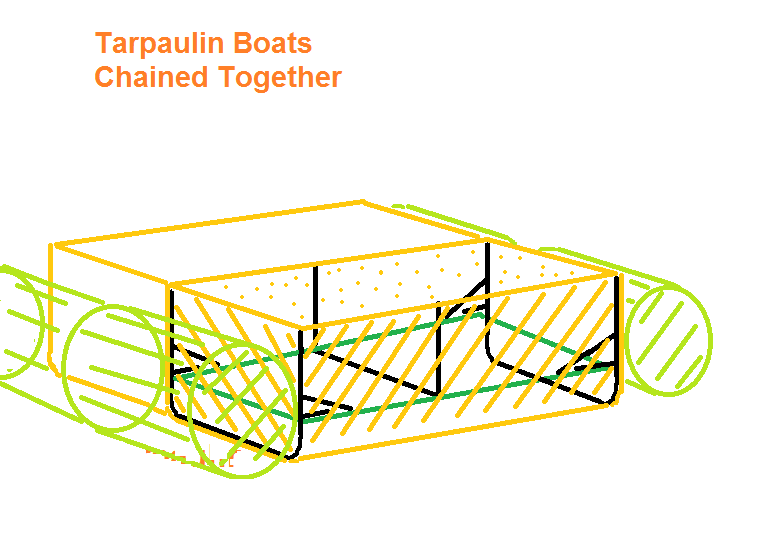 Another very simple design, that would make for a far more robust craft would be a barrel raft, shown in the image below. It’s just a bunch of barrels tied together. 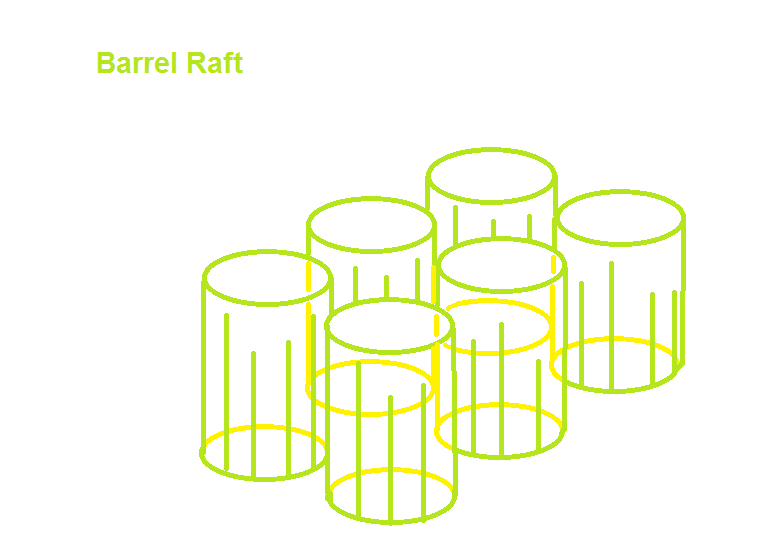 A barrel raft would be more resistant to debris and to sharp objects holing the bottom, but unless the barrels are broad enough to sit in, it would be less comfortable, and also less stable. Barrels are going to be a bit unwieldy so the best design we came up with ultimately was the Jerry Can Raft. The idea came from Dwiji Guru, a friend of mine who is a physicist and consults on design involving physics and on policy in Bangalore. He figured out that a craft displacing 10 litres of water can carry 10 kilograms of weight on water. So, ten 20 litre cans submerged to half their volume can carry a weight of 100 Kg. Cans like these http://shardacontainers.com/narrow-mouth-rectangular.htm are pretty tough and have a handle at the top. We figured that you can tie 12 cans with a long rope in pairs with their handles together along the center. Then tie one stiffening rod along the outside edges and two spacers at the front and back, and you’ll have a roughly 1 m by 2 m raft. This raft would be slim and light and almost impossible to sink.